How do I properly cut a bell pepper into a medium dice? 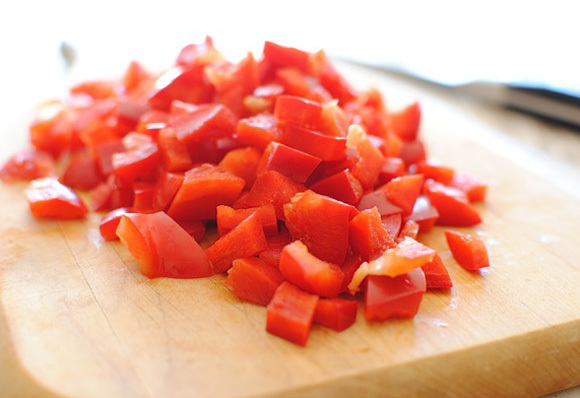 I often cut bell peppers up for uses in chili, stir-fry, salsas, salads, or any other similar use. What type of knife should I use and how should I cut it? I'm most interested in the techniques associated with efficiency and safety. My favourite knife for this application would be a French Knife because they are large and have good finger room under the handle when doing chopping. What I would do and always have done is start by cutting the top and bottom ends off of the pepper and remove the inside ribs and seeds from the pepper. After you cut the tops and bottoms off, keep them and then make i slice through the pepper to open it up into a flat open position. Lay the pepper down on the outer side UP and make 2-3 length-wise cuts across the pepper to make long strips of pepper also, do this with the ends of the pepper as well. Next I would simply cut them together or separate, depending on sharpness and size of knife as well as your skill and comfort and cut across the strips and make consistent sizes cuts all the way down. In my experience of cutting peppers this is my most desired and effective strategy. It also helps with efficiency and consistency of the cuts. Cut the pepper into strips of the appropriate size, then hold a bundle of strips in your off hand while you cut across them into cubes. As you're starting out, start with smaller bundles, then work your way to larger ones. (sharp knives make it easier to cut larger amounts at once, as they cut in rather than causing them to roll against each other). Not the answer you're looking for? Browse other questions tagged knife-skills cutting bell-peppers knife-safety or ask your own question. How do I properly cut a bell pepper into strips? How do I properly mince garlic? How can I hold a chefs knife for efficiency and safety? How do I properly mince ginger?